London, Friday 12 October – KISS, Universal Music and Aurasma proudly launch an epic bonus to the band’s brand-new album Monster using 3D Augmented Reality technology. Celebrating the release of KISS’ landmark 20th studio album, fans are invited to download the free uView app now to bring the Monster artwork to life with a one-of-a-kind performance in awe-inspiring 3D animation. In a truly unique and immersive digital experience, this exclusive album extra unlocks a new dimension to KISS as fully-3D digital Bobble Heads rocking out to radio hit “Hell or Hallelujah”, defying the laws of physics by performing in your hands, on your wall, or anywhere you need a Monster-good time, simply by using the Monster album artwork and the free uView app. Four decades ago Gene Simmons and Paul Stanley joined up with drummer Peter Criss and guitarist Ace Frehley to form KISS. Forty years later, having racked up 28 U.S. gold albums along with 40 million U.S. and 100 million in worldwide sales, Simmons and Stanley, with longtime members guitarist Tommy Thayer and drummer Eric Singer, return stronger than ever. With Monster, and the trailblazing use of advanced augmented reality mobile technology, KISS continues their career-long trend of being at the forefront of showmanship and innovation. 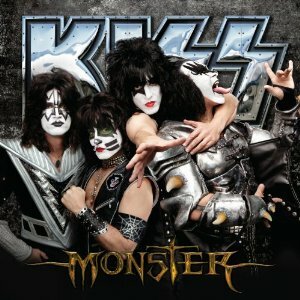 Monster, the 12-song, full-throttle rock ’n’ roll album features collaborations from all four members in an effort that shows KISS at the top of its game. The album finds a band with its legacy firmly in sight, a chip on their shoulder and a desire to prove there’s more to the KISS spectacle than meets the eye. The uView app and augmented content have been developed in partnership with Aurasma, the leaders in image recognition and augmented reality technology.